Whoosh! Suddenly you are rushing through the air on a giant arc, held by three cables attached to your harness. As you slow down, you look out to the grinning members of your group who are still holding the towrope. In this element the entire group works together to pull each person up as high as he or she is comfortable. 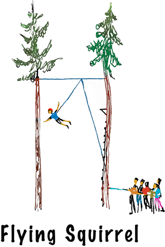 Once up in the air, the participant must pull a cord to release the towrope and set themself swinging. Taking a ride on the Giant Swing is a great way to challenge yourself, learn to trust your group, release fear or tension, and of course get that exhilarating rush!